A FREE to You Copy of James Burgess’ International Bestselling book CHAOS; How Business Leaders Can Master the Power of Focus as seen on ABC, NBC, FOX and CBS News learning valuable techniques for business planning that are entirely practical for business owners and department heads PLUS strategy upon strategy for business SUCCESS! The Equation For Success That Will Help You Break Through The Barriers Keeping A Cap On Your Business Income! The 5 Secrets To Effective Business Planning! The One Crucial Technique That Will Immediately Increase Your Revenue and Your Focus! The 5 Steps to Finding Your Life Purpose and Creating a Vision for Your Business that Motivates and Inspires! Hint: It starts with being very clear about what you don’t want! The 7 Ways That Business Planning Has Been Broken and How To Make Sure You Avoid These Common Errors! How To Maintain Your Plan With Focus and Clarity In As Little As 10 Minutes Per Week and Move Past The Overwhelm and Procrastination That Are Holding You Back! Society, technology, and business are moving forward at a faster and faster pace – and it can be hard to keep up. With so many options for growing your business – social media, franchising, JVs, mergers, acquisitions, and more – it can be overwhelming to know where to focus your valuable time and money. There is one tool that you can use to keep your business focused and on purpose – and growing! – while you bring balance back to your life. In CHAOS, James has shown you how to master the power of business planning and focus in an efficient way that keeps you moving toward your success instead of drowning in overwhelm and confusion. For the first time ever this simple business planning process allows you to rapidly RECOGNIZE, RECORD & REMEMBER your business success non-negotiables while RELEASING and REMOVING the barriers and time-wasters that have been keeping you stuck for months or years! Not only does James give you solid business planning strategies that will transform your business he gives tips and techniques for SALES CONVERSATIONS THAT WORK! Relationships in your business and your life will radically shift as you learn and then master the tools that are included throughout the book. With practical DO IT NOW exercises and DONE FOR YOU templates and worksheets, you’ll be able to implement what you learn right away! This offer will only be available for a limited time so make sure you take the leap and learn the power of FOCUS to change your business and change your life. Download this FREE Business Planning and Other Business Strategies for SUCCESS Book NOW! Yes! I want to master the power of focus and grow my business! 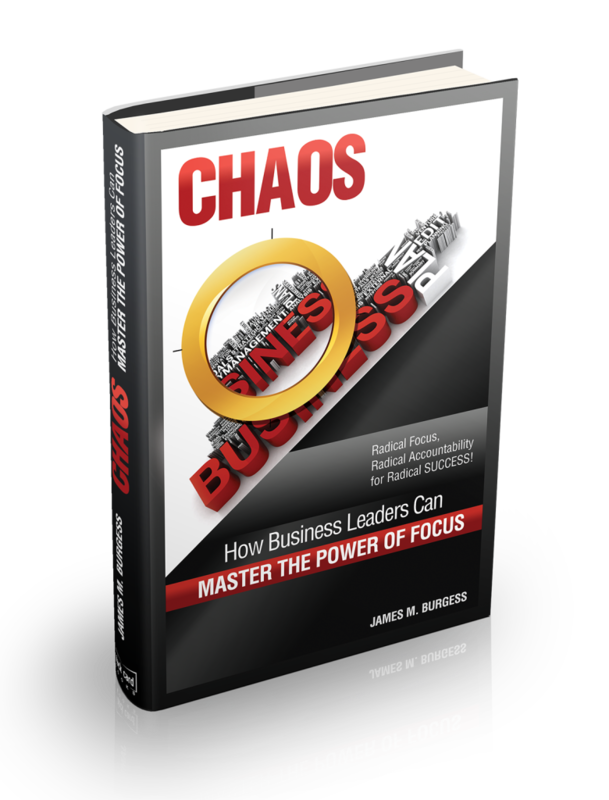 Get Your FREE Copy of CHAOS: How Business Leaders Can Master the Power of Focus Now!